Saturday, April 27th is Mill Valley’s Sixth Annual Volunteer Day on the Plaza and also the Butter and Eggs Day Parade will be held in Petaluma. Clean Mill Valley members will be participating in both events! Jill Young and Jeff Conley will join 20,000 people, including members of Clean Marin, the Clean River Alliance (Russian River), Friends of the Petaluma River and other Marin and Sonoma groups to create awareness of litter on land and in our waterways. There will be good music, floats and local luminaries. If you want to march with Jill and Jeff, please email Jill. Along with Ronnie Moore, our town’s volunteer coordinator, Joan Murray will be helping out at Volunteer Day. There will be at least thirty nonprofits in attendance to offer opportunities for service in our community and beyond. The Rock of Ages from The Redwoods will sing at noon and there will be a few interactive goings-on as well. It promises to be more vital than ever! Look for the Clean Mill Valley table and come say "hi." Keeping the Town Tidy: Peet's Goes the Extra Mile! 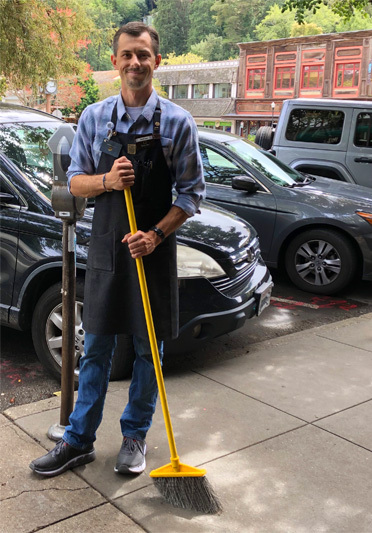 Peet’s Manager Matt Borello is a staunch supporter of Clean Mill Valley and an early enrollee in our merchant program. Pictured here, he is being true to his commitment to keep our business establishments litter-free and welcoming. To see more about the Mill Valley Merchant Program, click here. to Keep Mill Valley Clean and Litter-Free. In addition, Maureen Parton, Aide to Supervisor Kate Sears, also acknowledged our work with Clean Marin and our leadership in ridding our communities of litter. Thank you, Maureen, one of our hardest working and consistent supporters. 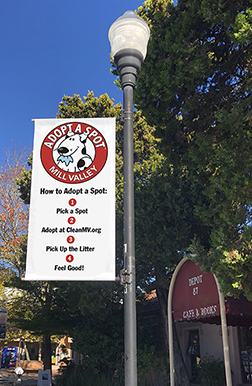 She also noted the work of Mary Osborn, the artist who has created Spot the Dog as well as Clean Mill Valley’s other litter graphics. Look for the banners in the Plaza downtown (see picture). Spot the Dog (all six feet of him) did attend the city council meeting to bring attention to our Adopt a Spot program. We will bring Spot to events, particularly schools. He was the brainstorm of Maureen Parton and we thank her for that. Clean Mill Valley continues to clean the Park and Ride Lot off Seminary Drive (West) and we are waiting for CalTrans to erect a sign that displays that we are the adopters. Be on the lookout. Jill Young and Joan Murray tidied up downtown by removing litter to welcome the Mill Valley Film Festival. So many of you are working in your communities and removing litter close to home. Peggy Katcher has continued her passion by continuing to clean the entrance to Mill Valley at Tower and East Blithedale. She is the poppy lady who introduced and tends those brilliant orange flowers. Karen Croy, a third grade teacher at Tamalpais Valley School, encourages her students to bring a piece of litter to class each morning. She is concerned about the environment and is teaching them to care about it too. A primary resolution to litter is to get to the source. Teaching children the impact of trash will have a significant impact. Thank you to everyone who continue to keep a little patch of our world litter-free! Some of our members have already adopted spots where they regularly pick up litter. We are seeing good results, but we need more hands! We are encouraging people to pitch in and adopt a section of a street in their neighborhood, an area of a favorite Step, Lane or Path, or an unsightly corner at a bus stop. We hope our combined efforts will help keep our town, its creeks, marshes and Bay clean. Lately, we have been conducting spontaneous cleanups when we notice a spot covered with trash. During a recent break in the rainy weather Clean Mill Valley members cleaned up the ditch adjacent to Tam High’s sports fields. You might have a friend or neighbor who wants to join you for an hour or so to remove litter in a problem spot. Feel free to organize that on your own and be safe. If you have any questions or would like to pitch in and officially adopt a spot to clean up, please contact Jill at adoptaspot@cleanmv.org. This will help us to coordinate our efforts and spread the word about Adopt A Spot! Would you like to report litter on the highway? Click here to file a report!